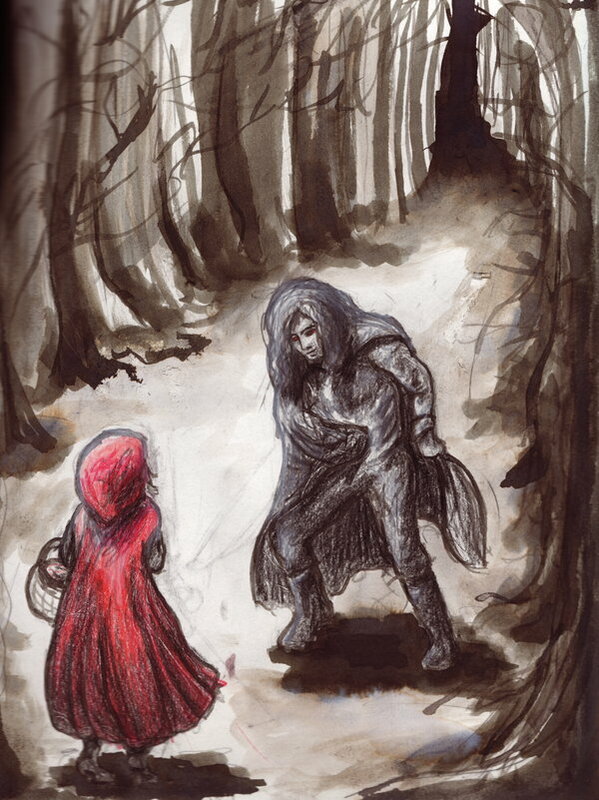 With this central image of a young girl being stalked and menaced through dark and foreboding forests by a snarling, sly and slathering beast, Little Red Riding Hood has also always had its roots firmly planted in horror. 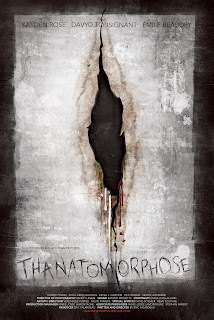 It shares its conservative morality with many fairytales that warn of what happens to young women who ‘stray from the path’ and indulge their ‘primal instincts’. 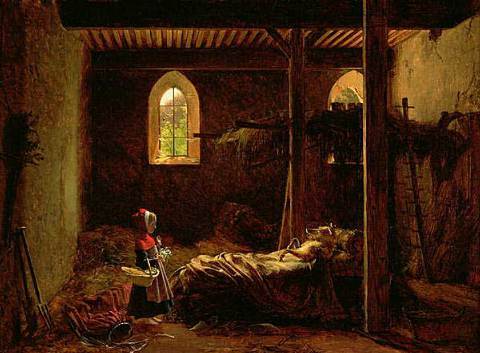 It is essentially a dark tale about sexual awakening. The forest, a place used time and again in literature and cinema to represent a place of hidden danger, primal fear and dark threat serves as the suitable backdrop; a place that is as far removed from civilisation as possible. 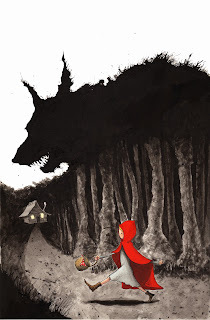 What further embeds the tale in horror is the fact that the Big Bad Wolf can be seen as a werewolf – another handy metaphor for physical and emotional transformation. Werewolves - humans who are condemned to spend their lives transforming into bloodthirsty beasts when the moon is full - are a common theme in mythology and folklore throughout the world, as well as in literature and cinema. They usually serve as allegories of our internal primal instincts and intrinsic savagery, buried deep down under years of civilisation and social conventions – but still lurking there nonetheless. The transformation of man into monster is representative of the manifestation of inner conflict - surrendering to the animal within, and to the primitive side of our nature. 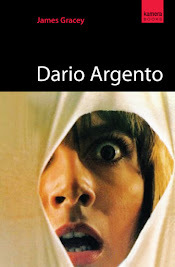 Most werewolf stories are concerned, on some level or other, with exploring the consequences of unleashed moral and sexual depravity, serving as allegories to warn us of the dangers of indulging our ‘animal’ instincts. Returning to Angela Carter’s ‘The Bloody Chamber’, we can see that she has utilised the figure of the werewolf to explore notions of unleashed female sexuality and empowerment. There are three takes on the tale of Red Riding Hood in Carter’s collection of short stories, and each one refigures the tale to reveal different aspects of ‘womanhood.’ Carter consistently challenges the way in which women are represented as passive victims and as such, the female characters in her retellings aren’t rescued by woodsmen, but by themselves, their mothers and by other women. The stories deal with ideas and notions of the traditional roles women play in relationships, the uneven balance of power, their burgeoning sexuality, identity, coming of age and their eventual ‘corruption’ at the hands (claws) of men and their base instincts. 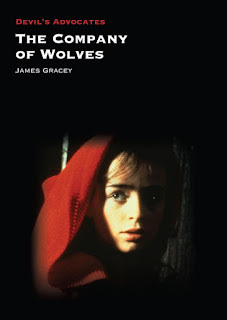 This notion found its way into John Fawcett's werewolf-movie-as-metaphor-for-menstruation, Ginger Snaps (2000); surely the most significant and effective example of 'feminist horror' since Carrie. 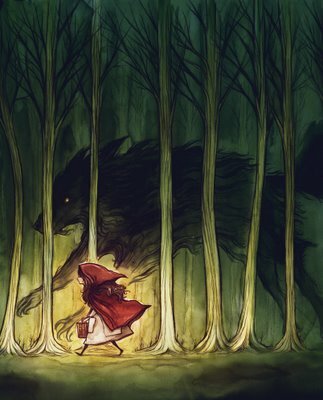 In Ginger Snaps, Little Red Riding Hood is the wolf. Catherine Hardwicke’s sensibilities and preoccupation with younger characters attempting to find themselves, and her choice of cast, compliments and at times even seems filtered through Carter’s own approach to Little Red Riding Hood as a tale of female empowerment. Red Riding Hood features a trinity of actresses renowned for their portrayals of strong, independent women in a myriad of unconventional roles and movies: Julie Christie, Virginia Madsen and Amanda Seyfried.